NEW YORK --(BUSINESS WIRE)--Aug. 19, 2014-- Hyatt Hotels Corporation (NYSE:H) announced today the opening of Park Hyatt New York, the flagship hotel of the globally recognized Park Hyatt brand that will offer unprecedented luxury in the heart of Midtown Manhattan . Guests of Park Hyatt New York will enjoy its prime location at 153 West 57th Street between Sixth and Seventh Avenues , which is within walking distance to Central Park and across the street from historic Carnegie Hall. 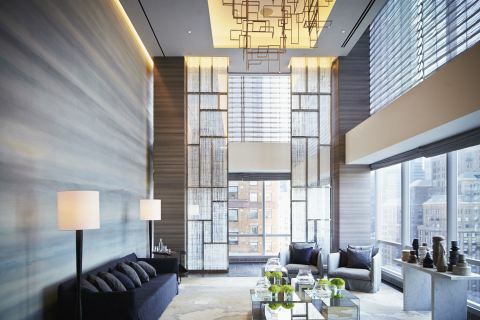 Park Hyatt New York features 210 luxurious guestrooms, including 92 premier suites, all with floor-to-ceiling windows. The hotel is nestled within the first 25 floors of the iconic, 90-story One57 skyscraper, designed by Pritzker Prize-winning architect Christian de Portzamparc. At 475 square feet, the standard rooms at Park Hyatt New York are among the largest in New York City and the majority of the hotel’s deluxe rooms span 530 square feet. Nightly rates for a standard room currently range from $795 to $1,295 . Park Hyatt New York is working with Carnegie Hall, Museum of Modern Art (MoMA), the Central Park Conservancy and Sotheby’s, among others, to offer its guests personalized, culturally authentic New York experiences entirely unique to the hotel. Art enthusiasts will enjoy a collection of 350 gallery-worthy artworks from Ellsworth Kelly , Rob Fischer , and Robert Longo , among others, with at least 10 pieces designed specifically for the hotel. Park Hyatt New York is also the only hotel worldwide to offer Tubereuse 40 bath amenities by Le Labo Fragrances, a fragrance exclusively blended for the hotel. World-renowned interior design firm, Yabu Pushelberg, created the vision for Park Hyatt New York’s interior design, which was inspired by New York’s most illustrious Upper East Side homes. The hotel’s design captures the energy and vibrancy of the city, utilizing signature elements tastefully layered with modern materials and furnishings. The firm curated intimate public and personal areas filled with art and custom furnishings. Executive Chef Sebastien Archambault leads Park Hyatt New York’s culinary operations, including the dining experiences in the restaurant, The Back Room at One57, The Living Room , and the hotel’s event spaces. Each venue is designed to become a destination in its own right for culinary-savvy New Yorkers, as well as hotel guests. The stylish, inviting 70-seat Living Room features a bar that overlooks historic Carnegie Hall and leads guests to The Back Room at One57, an American grill that seats 96 diners and will open August 25 . Modern and sophisticated, the menu features simple yet elegant preparations of the highest quality meats, seafood, and vegetables. Chef Sebastien joins Park Hyatt New York from the acclaimed Blue Duck Tavern at Park Hyatt Washington in Washington, D.C. The hotel’s exquisite Onyx Room , featuring illuminated white onyx walls and soaring heights, offers extraordinary dining and entertainment experiences and is large enough to host a seated dinner for 220 or a standing reception for 450. Additionally, Park Hyatt New York includes spacious residential-style meeting spaces and an executive boardroom with an exclusive outdoor terrace that will open later this year. Grounded in the principles of rejuvenation and wellness, the hotel’s sun-drenched Spa Nalai will indulge the most discerning travelers and locals with tailored spa treatments to meet a wide variety of needs. In the language of the Lenape people, the original tribe of Manhattan , Nalai means “Serenity,” a mood the spa promotes through a unique synthesis of both ancient and innovative healing techniques with advanced beauty rituals to craft a deeply personalized experience. Spa Nalai draws inspiration from its sister Park Hyatt spas around the world and offers a menu of treatments as part of its International Series that will change seasonally. Spa Nalai’s signature treatment is founded on the ancient tradition of earthing, identified as the practice of employing the Earth’s energy by grounding the body to the Earth’s natural surfaces, and takes place atop a warmed state-of-the-art sand quartz bed. Park Hyatt New York’s breathtaking three-story aerie on the 25th floor features a steam room, hydrotherapy hot tub, private changing rooms, and indoor swimming pool with underwater speakers playing an exclusive soundtrack from Carnegie Hall. A 24/7 state-of-the-art fitness center overlooking the aerie will promote health and wellbeing activities for guests. With the opening of Park Hyatt New York, Hyatt is now represented in Manhattan with eight hotels, including Grand Hyatt New York, Andaz Wall Street , Andaz 5th Avenue , Hyatt 48 Lex, Hyatt Union Square , Hyatt Times Square , and Hyatt Place Midtown-South. There also are two other Hyatt-branded hotels under development in New York - Hyatt House New York/Chelsea and Hyatt Place New York Times Square . For more information, please visit www.parkhyattnewyork.com or follow Park Hyatt New York on Twitter, Instagram or Facebook . Park Hyatt New York is the flagship hotel of the globally recognized luxury Park Hyatt brand. Designed by Pritzker Prize-winning architect Christian de Portzamparc and with Yabu Pushelberg at the helm of its interior design, the hotel’s 210 luxurious guestrooms offer a slight nod to the past, evoking an eclectic, residential aesthetic. Park Hyatt New York guests benefit from the hotel’s prime location across from Carnegie Hall and within walking distance to Central Park. The hotel allows the best local New York artists, chefs, interior and fashion designers, musicians and collectors to showcase their specialties, providing the ultimate guest experience. New Yorkers and worldwide travelers alike will enjoy an exquisite bar, The Living Room ; gourmet culinary offerings at The Back Room at One57; the phenomenal Spa Nalai; a 24/7 fitness center, and a stunning indoor swimming pool. For more information, visit www.parkhyattnewyork.com. Park Hyatt hotels provide discerning, affluent business and leisure guests with elegant and luxurious accommodations. Guests of Park Hyatt hotels receive highly attentive personal service in an intimate environment. Located in several of the world's premier destinations, each Park Hyatt hotel is custom designed to combine sophistication with a distinctive regional character. Park Hyatt hotels feature well-appointed guestrooms, meeting and special event spaces for groups, critically acclaimed art, food and beverage programs and signature restaurants featuring award-winning chefs. There are currently 34 Park Hyatt hotels in the following locations: Abu Dhabi , Beaver Creek , Beijing , Buenos Aires , Busan , Canberra , Carlsbad, Changbaishan, Chennai , Chicago , Dubai , Goa , Hamburg , Hyderabad , Istanbul , Jeddah , Maldives , Melbourne , Mendoza, Milan , Moscow , New York , Ningbo , Paris , Saigon , Seoul , Shanghai , Siem Reap , Sydney , Tokyo , Toronto , Vienna , Washington D.C. and Zurich . For more information, visit parkhyatt.com. Hyatt Hotels Corporation , headquartered in Chicago , is a leading global hospitality company with a proud heritage of making guests feel more than welcome. Thousands of members of the Hyatt family strive to make a difference in the lives of the guests they encounter every day by providing authentic hospitality. The Company's subsidiaries manage, franchise, own and develop hotels and resorts under the Hyatt®, Park Hyatt®, Andaz®, Grand Hyatt®, Hyatt Regency®, Hyatt Place®, Hyatt House®, Hyatt ZilaraTM, and Hyatt ZivaTM brand names and have locations on six continents. Hyatt Residential Group, Inc. , a Hyatt Hotels Corporation subsidiary, develops, operates, markets or licenses Hyatt Residences® and Hyatt Residence Club® . As of June 30, 2014, the Company's worldwide portfolio consisted of 563 properties in 48 countries. For more information, please visit www.hyatt.com. Forward-Looking Statements in this press release, which are not historical facts, are forward-looking statements within the meaning of the Private Securities Litigation Reform Act of 1995. Our actual results, performance or achievements may differ materially from those expressed or implied by these forward-looking statements. In some cases, you can identify forward-looking statements by the use of words such as “may,” “could,” “expect,” “intend,” “plan,” “seek,” “anticipate,” “believe,” “estimate,” “predict,” “potential,” “continue,” “likely,” “will,” “would” and variations of these terms and similar expressions, or the negative of these terms or similar expressions. Such forward-looking statements are necessarily based upon estimates and assumptions that, while considered reasonable by us and our management, are inherently uncertain. Factors that may cause actual results to differ materially from current expectations include, among others, the rate and pace of economic recovery following economic downturns; levels of spending in business and leisure segments as well as consumer confidence; declines in occupancy and average daily rate; if our third-party owners, franchisees or development partners are unable to access the capital necessary to fund current operations or implement our plans for growth; changes in the competitive environment in our industry and the markets where we operate; our ability to access the capital markets; and other risks discussed in the Company's filings with the U.S. Securities and Exchange Commission , including our Annual Report on Form 10-K, which filings are available from the SEC . We caution you not to place undue reliance on any forward-looking statements, which are made as of the date of this press release. We undertake no obligation to update publicly any of these forward-looking statements to reflect actual results, new information or future events, changes in assumptions or changes in other factors affecting forward-looking statements, except to the extent required by applicable laws. If we update one or more forward-looking statements, no inference should be drawn that we will make additional updates with respect to those or other forward-looking statements.